Looking for a way to lower the amount of free chlorine and chloramines in the water you use in the garden… but don’t want the hassle of installing a complicated water filter? 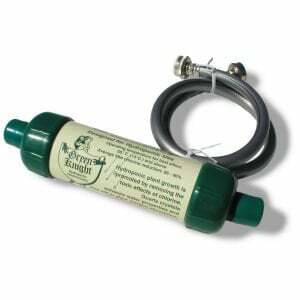 If so, then we suggest you consider the Green Knight Hydroponic Dechlorinating Filter. Functioning as an easily installed inline filter, the Green Knight screws right onto the average 3/4″ garden hose and promotes healthy plant growth by effectively reducing and/or removing potentially harmful chlorine from the water and also contains quartz crystals which aid plants’ absorption of vital nutrients. Rainshow’r Green Knight uses a polyester pre-filter to catch sediment and then allows water to pass through 2 pounds of specially blended KDF55, 2 ounces of quartz crystal, and a final polishing stage which contains KDF73 filament media. This product also comes with a sturdy 3-foot vinyl hose so that people can reap the benefits of the chlorine filter near the spigot/faucet w/o having to wrestle with a full-length garden hose. This works out well for rinsing off metal tools, washing mud off of dogs, etc. Oh, and we learned something new while researching this product: People have found that reducing chlorine levels in rinse and wash water can greatly extend the life and luster of organic carnuba wax jobs on cars, boats, RV’s, etc. Freezing will cause irreparable damage to the unit, as will not running water through the unit at least twice a month after its first use. 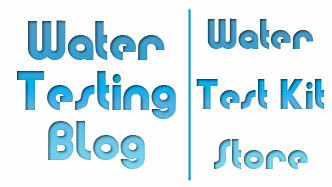 Will the Rainshow’r Green Knight work as a drinking water filter? Rainshow’r, the manufacturer of Green Knight Hydroponic Dechlorinating Filter designed this product for use in the garden and for outdoor applications, not for use a device to make water potable. 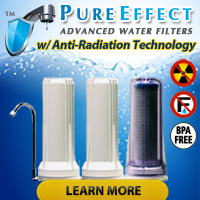 It lacks sufficient filter media capable of removing particulate matter and other contaminants such as organic chemicals, heavy metals (lead, iron, copper, mercury, etc.) and bacteria from source water.